The 21st of November 2005 [was] the 160th anniversary of the inauguration of railway services in Jamaica. This was only twenty years after the first public railway in the world was opened to traffic between Stockton and Darlington in England. However Jamaica was not the first Caribbean country to offer public railway service as in 1837 Cuba became the seventh country in the world with railway services when the Havana to Bejucal line was opened. The Jamaica Railway Company was established in 1843 by two brothers, William Smith of Manchester, England and his brother David , resident in Jamaica. A single track line was constructed between Kingston and Spanish Town, the termini in both instances being located where the stations exist today. The railway was officially opened on Friday 21st November with great pomp and ceremony. A carefully selected group of dignitaries and the more wealthy and influential citizens of the community was invited to become the first passengers. The group was headed by His Excellency the Governor, Lord Elgin, and included officers of the military, heads of departments of the civil service and members of the Assembly. Large crowds assembled at both termini to witness the departure and arrival of the train. Lord Elgin arrived at the Kingston terminus at eleven a.m. and was received by a guard of honour mounted by the First West India Regiment, whose band played the national anthem. At about 11.30 His Excellency was led to the opulent carriage provided for him, and the other passengers took their assigned seats. The band of the West India Regiment occupied the last carriage, playing festive music appropriate for the occasion. The new locomotive “The Projector” was hooked up and the train, consisting of ten carriages, set off on its first official journey. It proceeded slowly, stopping on two or three occasions to allow His Excellency to observe and admire the engineering skills employed in the construction of the line through the swamp, then known as “The Islands”, and the new bridge over the Rio Cobre. Large crowds assembled on both sides of the track in those sections where access was possible, cheering in delight as this new engineering wonder passed by. The train arrived at the Spanish Town Terminus at twelve thirty and the passengers were allowed to disembark and view the works there. The twelve miles between the termini had been covered in an hour, including the stops. The locomotive was relocated to the other end of the train and the return journey began at one p.m. The speed was still restrained in order to not to endanger the crowds along the tracks, but in appropriate sections it was increased to 40 miles per hour whereas it had been restricted to 30 miles per hour on the outward journey. The return journey was completed in 40 minutes. After the original passengers had disembarked a second trip got underway, the return leg on this occasion being completed this time in 25 minutes. After disembarkation, the Governor and the other distinguished personages who comprised the first group of passengers, about 120 in number, retired to a sumptuous meal hosted by the company’s sponsors at The Victoria Rooms on Duke Street. Serving of food began shortly after two p.m. The Illustrated London News reported that “several well-timed speeches were made and the company did not separate until a late hour”. In December 1845 The Gleaner recorded what must certainly have been the first penalty ever imposed for speeding in the British Caribbean when Isaac Taylor, a locomotive driver, was fined two pounds “for disobeying orders in having put the train at a speed of 40 miles per hour instead of 20 as he had been ordered, thereby causing great alarm and endangering the lives of the passengers”. In 1867 the line was extended 11 miles to Old Harbour, service being provided from July 1869. However the areas serviced did not provide a sufficiently large population to make the railway a profitable operation and the company was sold to the government in 1879. A considerable amount of public funds was invested in upgrading and increasing access to the service. The network was extended from Old Harbour to Porus and from Spanish Town to Ewarton. The latter extension involved construction of four tunnels through solid rock. One of these, in the Rio Cobre gorge, remains Jamaica’s longest and although often referred to as the “one-mile tunnel” is in fact 735 yards long. The operations began to turn a profit and in 1889 the government sold the company at a handsome profit to an American syndicate, the West India Improvement Company. However the government skillfully included in the sales contract an undertaking by the purchasers to extend the lines to Montego Bay and Port Antonio. Given the island’s mountainous topography and limestone geology this contract provision worked extremely well to the government’s advantage. Both extensions were extremely difficult. The 50 mile distance between Bog Walk and Port Antonio required excavating 25 tunnels, effectively through solid rock. The latter sections of the line to Port Antonio ran along the spectacularly beautiful north-coast, with palm-fringed beaches and the deep blue sea, but which was not ideal for construction of railway lines. The extension to Montego Bay was placed in service in 1894 and that to Port Antonio in 1896. The investment in these extensions proved to be beyond the syndicate’s resources and the company went broke. In 1900 ownership of the railway reverted to the government and the Jamaica Government Railway was established. After 1900 the only major extension to the network was from May Pen, first to Chapelton in 1913 and then to Frankfield in 1925. The total line length was then 205 miles, the longest stretch being 115 miles between Kingston and Montego Bay. All lines were single track and train movements were controlled by a central telegraph system. ”Stations” were established at intervals along each line, each station being equipped with the telegraphic apparatus and managed by a Station Master who resided on the premises. If a train wished to move from Station A to Station B, the Station Master at A would telegraph the Station Master at B to ask if he would accept the train. If B accepted then Station Master A would telegraph the central dispatcher in Kingston for permission to let the train proceed. If permission was given Station Master A would make out a clearance card to give the train driver before the train could move. Station Master Band the central dispatcher would then be informed that the train was on its way. In this way the central dispatcher was kept informed of all movements on the system. Lines crossing little traveled roads normally had no gates but warning suns only. Crossings on more frequently traveled roads were usually operated by a gateman who lived in a hut at the crossing. On hearing the whistle of an approaching train the gateman (or some member of his family) would rush to close the gate and bar road traffic from crossing the lines. Until the outbreak of the Second World War the locomotives were fueled with coal.or more properly, with coke. The coal was heated near the railway yards to generate coal gas which was used for street lighting in Kingston, lamplighters being engaged to turn on the gas and light the flames in each individual lamp at dusk. During the war difficulties were experienced in obtaining regular supplies of imported coal and the locomotives were converted to burn local hardwood, especially logwood. After the war the locomotives were converted to burn oil. Diesel rail buses began operating in the war years and in the 1950s diesel locomotives began to displace the steam counterparts. 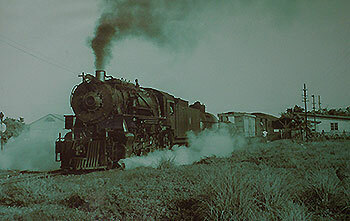 By the early 1960s steam locomotives were used only for specially arranged excursions, the last such in 1966. In the postwar years profitability of the railway began to suffer under competition from road transport for passenger and freight traffic. In 1959 ownership of the railway was transferred from the Jamaica Government Railway to a statutory corporation, the Jamaica Railway Corporation, headed by Don Tretzel, then the general Manager of Kaiser Bauxite Mines. Operations improved significantly initially and in 1964, it made a profit of more than £100,000, the largest in its history. Profitability was helped significantly by alumina transport which led to increased demands on the Railway’s facilities. Passenger traffic, which by 1969 was exceeding one million per year also showed remarkable increase over the period. However in the 1970s the picture began to grow less rosy. Maintenance of the system began to deteriorate and some unfortunate decisions in rolling stock purchases placed the Corporation under severe financial stress. Irregularly schedule maintenance exacerbated the competitive disadvantages of the railway and in the 1970s the May Pen to Frankfield line was closed. Hurricane Gilbert in September 1988 put the Spanish Town to Port Antonio line out of operation and finally in 1993 the Corporation ceased all scheduled operations. At this time the only sections of the JRC network in regular use provides services to the Windalco alumina plants in Ewarton and Kirkvine, near Williamsfield, Manchester. The lines are used to transport alumina from the plants to Windalco’s wharves at Port Esquivel as well as to transport imported material from Port Esquivel to the plants. The railway played a vital role in Jamaica’s history. It led to economic development, particularly in the banana and alumina industries. It also contributed to the island’s social life as for the first time a wide cross-section of the population was enabled to travel almost island-wide.